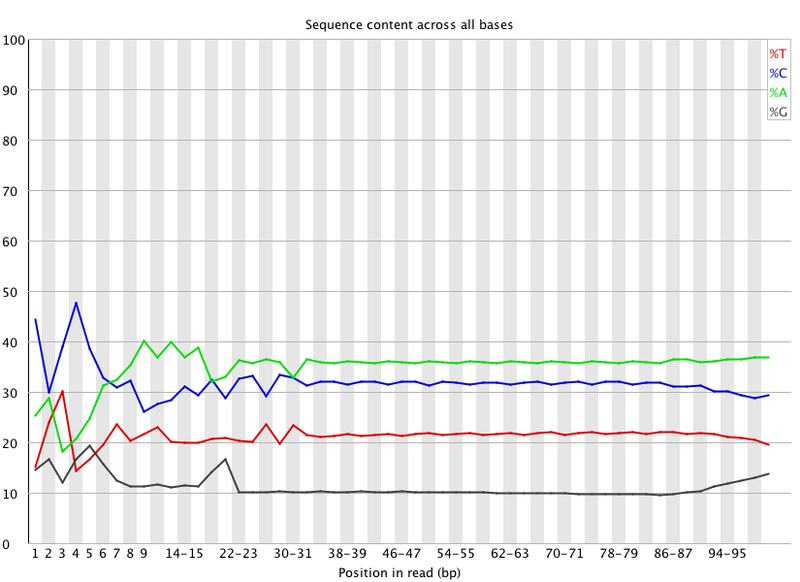 Trim first 39 bases from all reads in all raw sequencing files. Concatenate the two sets of reads (400ppm and 1000ppm treatments) into single FASTQ files for Steven to work with. Trimming has removed the intended bad stuff (inconsistent sequence in the first 39 bases and rise in %G in the last 10 bases). Sequences are ready for further analysis for Steven. However, we still see the “waves” pattern with the T, A and C. Additionally, we still don’t know what caused the weird inconsistencies, nor what sequence is contained therein that might be leading to that. Will contact the sequencing facility to see if they have any insight. This entry was posted in Crassostrea gigas larvae OA (2011) bisulfite sequencing and tagged bioinformatics, BS-seq, Crassostrea gigas, FASTQC, Illumina, ipython notebook, jupyter notebook, NGS sequencing, Pacific oyster, Trimmomatic on 22 May, 2015 by kubu4. You can see how flat the newly trimmed data is (which is what one would expect). Steven will take this trimmed dataset and try additional mapping with it to see if removal of the first 39 bases will improve the mapping. This entry was posted in Crassostrea gigas larvae OA (2011) bisulfite sequencing and tagged bioinformatics, BS-seq, Crassostrea gigas, FASTQC, graphs, ipython notebook, jupyter notebook, Pacific oyster, Trimmomatic, troubleshooting on 6 May, 2015 by kubu4. This entry was posted in Crassostrea gigas larvae OA (2011) bisulfite sequencing and tagged bioinformatics, blast, BLASTn, BS-seq, Crassostrea gigas, GenBank, ipython notebook, jupyter notebook, ncbi, Pacific oyster on 4 May, 2015 by kubu4. My primary goal for this project is to successfully isolate RNA from the remaining, troublesome paraffin blocks that have yet to yield any usable RNA. The next approach to obtain usable quantities of RNA is to directly gouge tissue from the blocks instead of sectioning the blocks (as recommended in the PAXgene Tissue RNA Kit protocol). Hopefully this approach will eliminate excess paraffin, while increasing the amount of input tissue. Once I have RNA from the entire suite of samples, I’ll check the RNA integrity via Bioanalyzer and then we’ll decide on a facility to use for high-throughput sequencing. Currently, there are two projects that we have performed BS-Seq with (Crassostrea gigas larvae OA (2011) bisulfite sequencing and LSU C.virginica Oil Spill MBD BS Sequencing) and we’re struggling to align sequences to the C.gigas genome. Granted, the LSU samples are C.virginica, but the C.gigas larvae libraries are not aligning to the C.gigas genome via standard BLASTn or using a dedicated bisulfite mapper (e.g. BS-Map). I’m currently BLASTing a de-novo assembly of the C.gigas larvae OA 400ppm sequencing that Steven made against the NCBI nt DB in an attempt to assess the taxonomic distribution of the sequences we received back. I’ll also try using a different bisulfite mapper, bismark, that Mackenzie Gavery has previously used and has had better results with than BS-Map. As part of Claire’s project, there’s still some BS-Seq data that would be nice to have to complement the data she generated via microarray. It would be nice to make a decision about how to proceed with the samples. However, part of our decision on how to proceed is governed by the results we get from the two projects above. Why do those two projects impact the decision(s) regarding this project? They impact this project because in the two projects above, we produced our own BS-Seq libraries. This is extremely cost effective. However, if we can’t obtain usable data from doing the library preps in-house, then that means we have to use an external service provider. Using an external company to do this is significantly more expensive. Additionally, not all companies can perform bisulfite treatment, which limits our choices (and, in turn, pricing options) on where to go for sequencing. When I have some down time, I’ll continue working on migrating my Wikispaces notebook to this notebook. I only have one year left to go and it’d be great is all my notebook entries were here so they’d all be tagged/categorized and, thus, be more searchable. I’d also like to work on adding README files to our plethora of electronic data folders. Having these in place will greatly facilitate the ability of people to quickly and more easily figure out what these folders contain, file formats within those folders, etc. I also have a few computing tips/tricks that I’d like to add to our Github “Code” page. Oh, although this isn’t really lab related, I was asked to teach the Unix shell lesson (or, at least, part of it) at the next Software Carpentry Workshop that Ben Marwick is setting up at UW in early June. So, I’m thinking that I’ll try to incorporate some of the data handling stuff I’ve been tackling in lab in to the lesson I end up teaching. Additionally, going through the Software Carpentry materials will help reinforce some of the “fundamental” tasks that I can do with the shell (like find, cut and grep). In the lab, I plan on sealing up our nearly overflowing “Broken Glass” box and establishing a new one. I need to autoclave, and dispose of, a couple of very full biohazard bags. I’m also going to vow that I will get Jonathan to finally obtain a successful PCR from his sea pen RNA. This entry was posted in Crassostrea gigas larvae OA (2011) bisulfite sequencing, Goals, Lineage-specific DNA methylation patterns in developing oysters, LSU C.virginica Oil Spill MBD BS Sequencing, Protein expression profiles during sexual maturation in Geoduck and tagged BS-seq, Crassostrea gigas, Crassostrea virginica, Eastern oyster, geoduck, Pacific oyster, Panopea generosa on 1 May, 2015 by kubu4. The results are not great. All query contigs successfully BLAST to sequences in the C.gigas Ensembl BLAST DB. However, only 33 of the sequences (out of ~37,000) have an e-value of 0.0. The next best e-value for any matches is 0.001. For the uninitiated, that value is not very good, especially when you’re BLASTing against the same exact species DB. Will BLASTn the C.gigas contigs against the entire GenBank nt (all nucleotides) to see what the taxonomy breakdown looks like of these sequences. This entry was posted in Crassostrea gigas larvae OA (2011) bisulfite sequencing and tagged blast, Crassostrea gigas, ipython notebook, jupyter notebook, Pacific oyster on 29 April, 2015 by kubu4. This entry was posted in Crassostrea gigas larvae OA (2011) bisulfite sequencing and tagged bioinformatics, BS-seq, Crassostrea gigas, FASTQC, ipython notebook, jupyter notebook, larvae, OA, ocean acidification, Pacific oyster, Trimmomatic on 15 April, 2015 by kubu4. Compared total amount of data generated from each index. The commands below send the output of the ‘ls -l’ command to awk. Awk sums the file sizes, found in the 5th field ($5) of the ‘ls -l’ command, then prints the sum, divided by 1024^3 to convert from bytes to gigabytes. There’s ~1.4x data in the GCCAAT files. This entry was posted in Crassostrea gigas larvae OA (2011) bisulfite sequencing and tagged BS-seq, Crassostrea gigas, FASTQC, larvae, NGS sequencing, OA, ocean acidification, Pacific oyster on 13 April, 2015 by kubu4. I had previously contacted Doug Turnbull at the Univ. of Oregon Genomics Core Facility for help demultiplexing this data, as it was initially returned to us as a single data set with “no index” (i.e. barcode) set for any of the libraries that were sequenced. As it turns out, when multiplexed libraries are sequenced using the Illumina platform, an index read step needs to be “enabled” on the machine for sequencing. Otherwise, the machine does not perform the index read step (since it wouldn’t be necessary for a single library). Surprisingly, the sample submission form for the Univ. of Oregon Genomics Core Facility doesn’t request any information regarding whether or not a submitted sample has been multiplexed. However, by default, they enable the index read step on all sequencing runs. I provided them with the barcodes and they demultiplexed them after the fact. Notice that the file names now contain the corresponding index! Updated the readme.md file to reflect the addition of these new files. This entry was posted in Crassostrea gigas larvae OA (2011) bisulfite sequencing and tagged BS-seq, Crassostrea gigas, larvae, NGS sequencing, OA, ocean acidification, Pacific oyster on 13 April, 2015 by kubu4. Our sequencing data (Illumina HiSeq2500, 100SE) for this project has completed by Univ. of Oregon Genomics Core Facility (order number 2212). Note: In order for the readme file to appear in the web directory listing, the file cannot be all upper-case. This entry was posted in Crassostrea gigas larvae OA (2011) bisulfite sequencing and tagged BS-seq, checksum, code, Crassostrea gigas, curl, HiSeq2500, larvae, md5, OA, ocean acidification, Pacific oyster on 19 March, 2015 by kubu4. Ran the 400ppm library and the 1000ppm library preps on a DNA1000 Assay Chip (Agilent) on the Agilent 2100 Bioanalyzer. 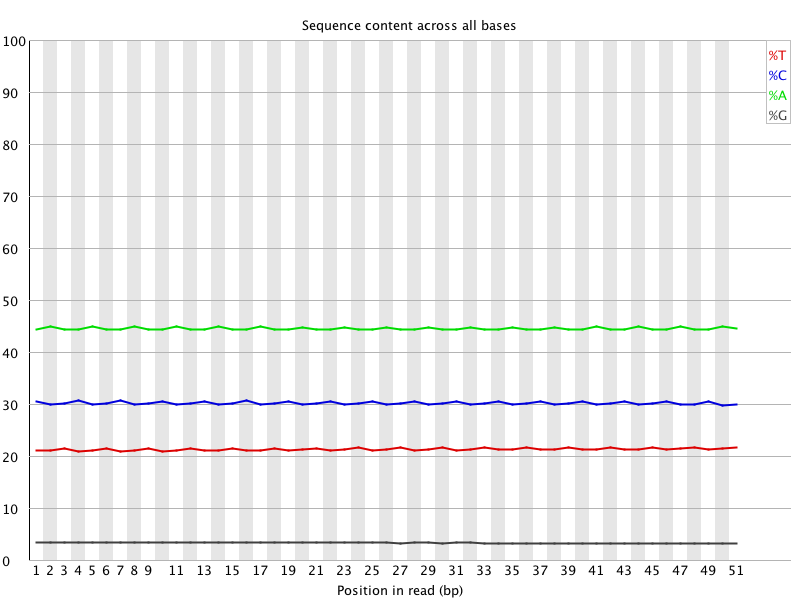 Both libraries look good; no adaptor contamination (peak would be present at ~125bp), good library sizes. Pooled equal quantities of each library, based off the concentration values above, to prepare the sample for sequencing. The pooled libraries will be submitted tomorrow to the Genomics Core Facility at the Univ. 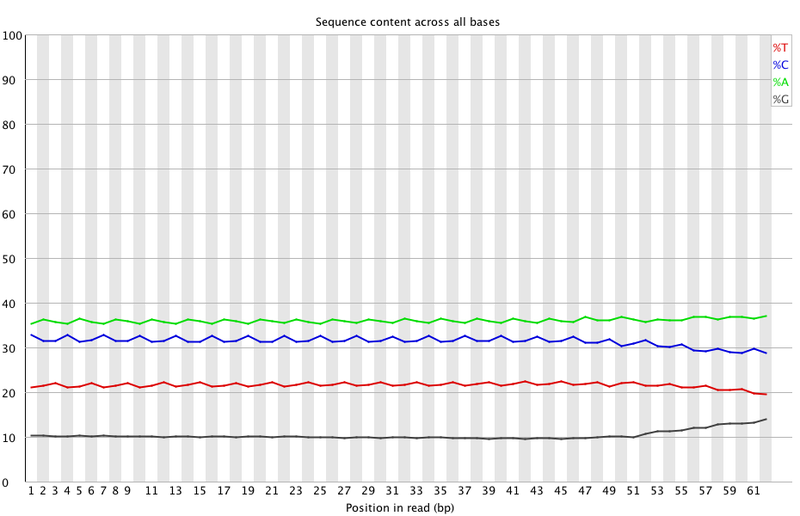 of Oregon for high-throughput sequencing (100bp, SE) on the HiSeq2500 (Illumina). Sample order #2212. This entry was posted in Crassostrea gigas larvae OA (2011) bisulfite sequencing and tagged bioanalyzer, BS-seq, Crassostrea gigas, EpiNext Post-Bisulfite DNA Library Preparation Kit, Genomics Core Facility, larvae, library prep, OA, ocean acidification, Pacific oyster, University of Oregon on 2 March, 2015 by kubu4.